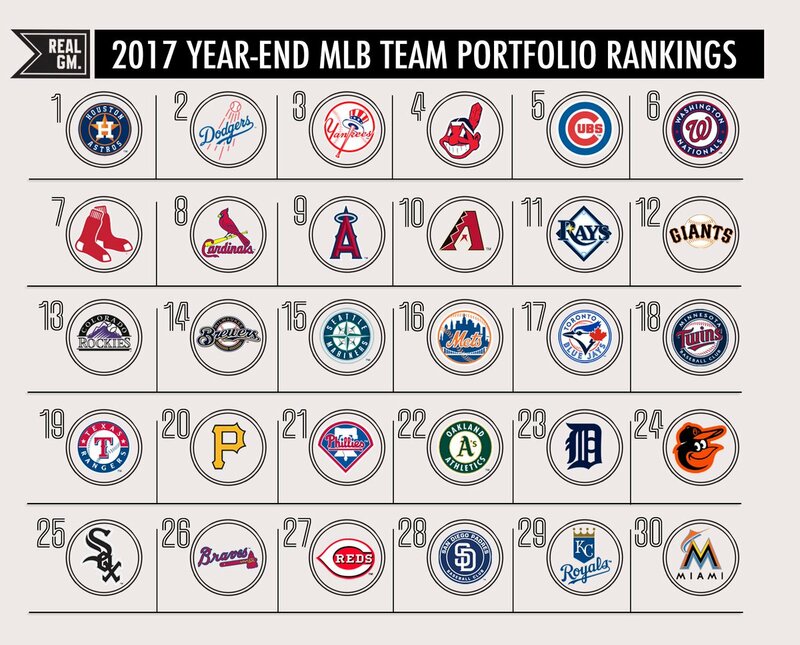 For the third straight year, we have created a year-end team portfolio ranking for Major League Baseball. The exercise is to evaluate every team as if they were a portfolio of assets to determine which is most valuable. The only considerations are talent, age, contract situations and farm system with the goal being to eventually compete for and win the World Series. An older team already contending is more valued than a younger team with a ton of talent that may not get there, but the younger team with upside is a better bet than an older team that’s currently better but without the upside. There is no consideration given to the team location, history, manager, general manager or owner. The MLB has an ever-changing landscape but this creation of a hierarchical ranking gives a look to how we would choose their collective situations at the end of 2016. Last year's rankings are in parenthesis, which you can read here and 2015 here. - Also see RealGM's Year-End Team Portfolio Rankings for the NBA, NFL and Soccer.